The ad was seeking a karate instructor for the campus recreation department. A pair of students — sisters, athletes, second-degree black belts — threw their collective hat in the ring. 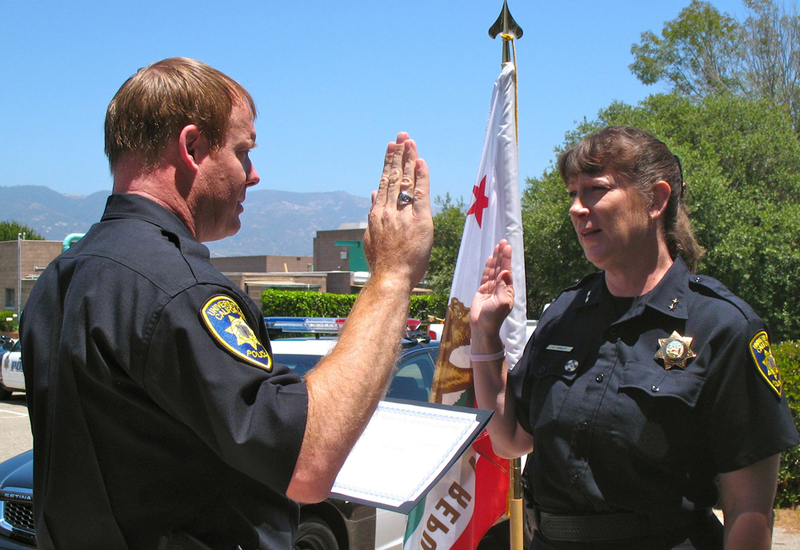 And so began, in 1983, Cathy Farley’s storied tenure with the UC Santa Barbara Police Department. Today, a mere 35 years later, she departs the campus where she ran track as a student athlete then blazed trails as a female officer. And what an opportunity it’s been for her. Farley also was among the department’s first female officers and was its first-ever to have a baby and return to the beat (she ultimately had three kids). Supporting other women in law enforcement was a natural priority. 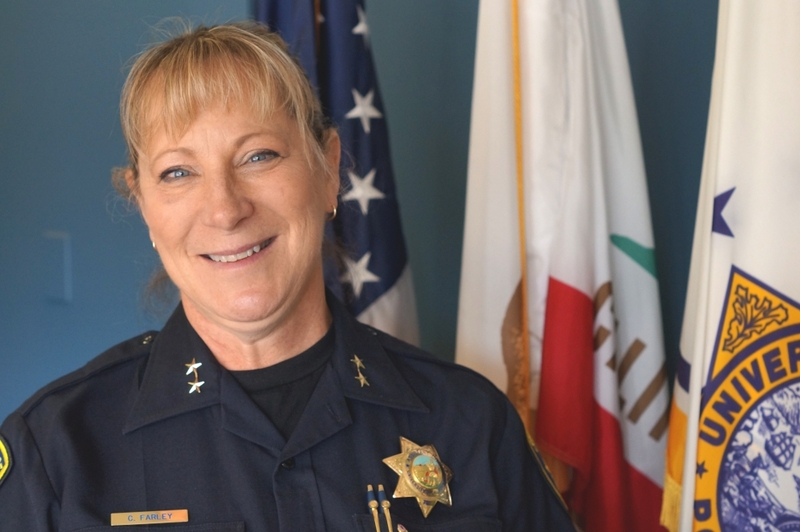 She was the driving force behind UCSB PD’s participation in the California Chiefs Women Leaders in Law Enforcement Conference (they’re sending more officers every year) and is working to create a peer support group for UC and CSU women in law enforcement. In 2012, Farley completed a rigorous 10-week training course at the FBI National Academy in Quantico, Virginia — an opportunity afforded only 1 percent of law enforcement officers nationwide. Soon after, she was promoted to assistant chief at UCSB, then a new role and, to date, the highest rank held by a woman in the department. Current Chief Dustin Olson recalled Farley as “warm and welcoming” from the time he arrived at UCSB in 2009. “It became readily apparent that she was very talented and was passionate about campus safety and the profession of law enforcement,” Olson said of Farley. “As a result, I nominated Cathy to attend the prestigious FBI National Academy and it was at the academy graduation ceremony where I was able to promote her to Assistant Chief. Cathy Farley loves this song. It’s all true, of course, and, she said, apropos of nearly all her life experiences so far. Moving with her family from Chicago to California as a kid and transferring to UC Santa Barbara as a teen athlete. Landing a student job at the UCSB Police Department and parlaying that — nearly accidentally — into a full-time gig after graduation. Pregnancy. Cancer. The diagnosis of high-stage breast cancer was in 2008. Determined to beat it, she had a lot of help. The entire department — and many in the community — shaved their heads in solidarity with Farley, left bald by her treatment. That’s saying something. This coming from a woman who rose through nearly every rank in her department, who has served on the countywide Sexual Assault Response Team and the regional Isla Vista Safe Committee, who has been a steadfast supporter not only of her peers, but also of the countless students she has encountered. Some of Farley’s proudest moments, she said, have also been the most difficult. “I’ve seen a lot of things — reports of sexual assault and domestic violence — things that really touched me,” Farley said. “Nobody wants to take those kinds of reports. You want someone doing it who is compassionate and who cares to do it right. That became one of my passions as an officer, as a sergeant, and to this day. 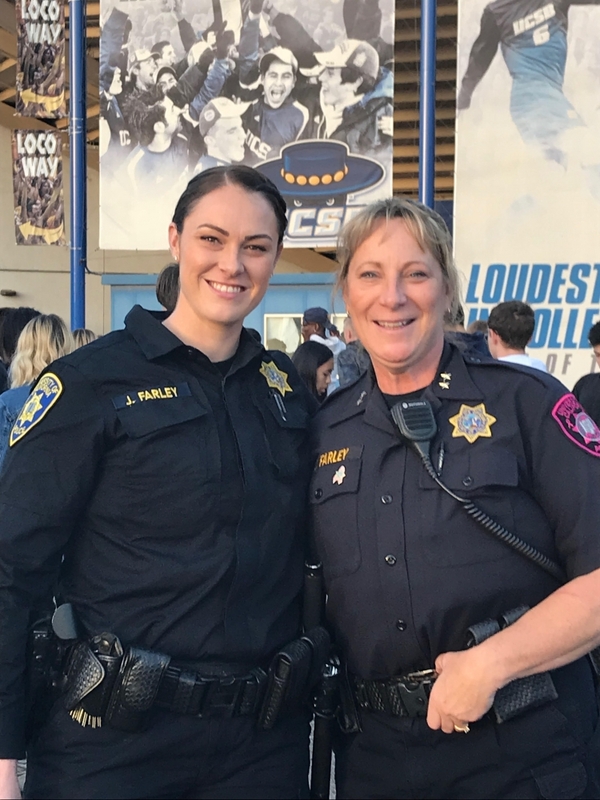 She may be leaving UC Santa Barbara, but Farley isn’t slowing down her drive to support students: Monday she’ll be sworn in as the new chief of police at Santa Maria’s Allan Hancock College. In a way, it’s trading one home for another — all of her kids went through Hancock before transferring to other institutions.